A novel little book with the odd title The Pajamazon Amazon vs The Goofers Twofers popped into my procurement window on the Amazon.com website (of all places). The cover art by Alyssa Riegert (BrownBoots Interactive) was equally compelling, so I sent the reasonable $6 plus postage into the ether and within days received a handsome trade-sized paperback written for second- and third-grade readers as well as their parents. But, of course, Stephanie and David Williams belong to Allied Authors of Wisconsin. Moreover, all AAW members have been following their progress since the project officially kicked off in March of 2012 — “officially” because in a singular fashion, the Pajamazon Amazon concept had its inception years earlier, when the authors would get their infant daughter, Gwendolyn, ready for bed by putting on her onesie pajamas and joking about her super-hero alter ego. Gwen, who is now eight, drew the book’s delightful set of black-and-white interiors, which fans can also see in full color at www.pajamazonamazon.com. The Pajamazon Amazon is Stephanie and David’s first attempt at co-authoring a piece of fiction and their first foray into print-on-demand/self-publishing. The couple developed the story’s plot and characters together but alternated writing the chapters — each picking the story up where the other left off. 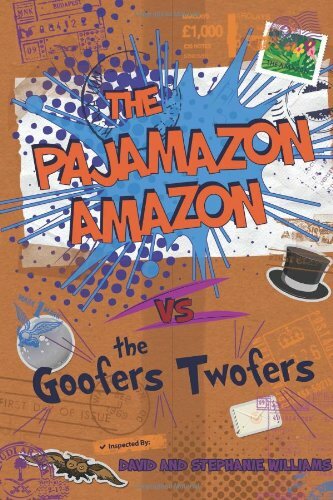 The Pajamazon Amazon vs The Goofers Twofers is a children’s chapter book about a girl with magical pajamas. Not unlike many iconic costumed heroes in their earliest adventures — e.g., the teenaged Spider-Man — the Pajamazon Amazon must learn an important lesson (to use her magical powers selflessly rather than selfishly) before confronting a truly squirrely threat. The book was published through CreateSpace in December 2013 and is available at Amazon.com. This entry was posted on Friday, December 27th, 2013 at 3:33 pm	and posted in News. You can follow any responses to this entry through the RSS 2.0 feed. Great cover, great info. Congrats to David, Stephanie and Gwen Well done. I’ll be purchasing.